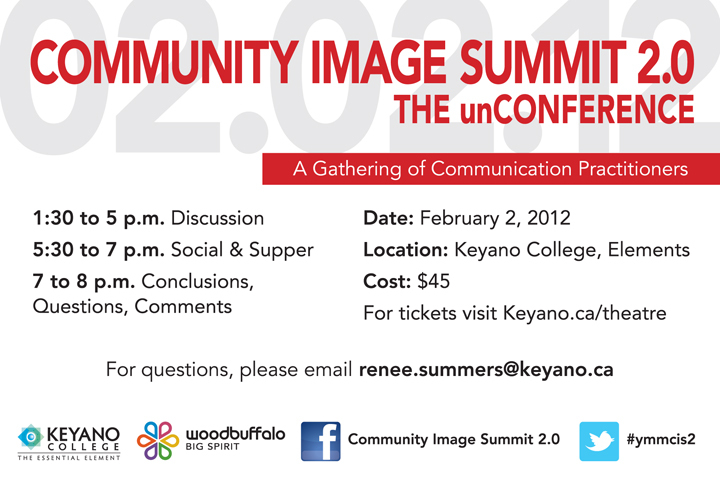 At long last, about 80 communicators and leaders will gather at Keyano College for the Community Image Summit 2.0 - the unCONFERENCE. I'd have to go back to 2006 when I first started hearing the term "community image" as an area of concern, though I would guess it was long before then that our "issue" emerged. Unlike other conferences or workshops, we're going into today's session with a framework, but no agenda. Rather than imposing an order of events or a set of questions or topics, we want the delegates to shape the day, from the themes we explore to the way we dive into them, from potential conclusions we'll make to actions we will take. While we're having these rich conversations and debates, we'll be sharing light bulb moments, questions and random thoughts on Facebook and using our Twitter hashtag #ymmcis2. We want people not attending to chime in. This is an exercise in total transparency. 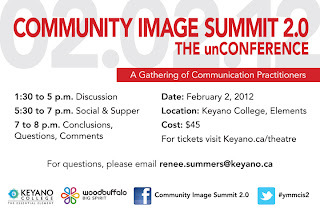 The day will begin with all the themes and topics that have been suggested in advance displayed on the wall in Elements at Keyano College. Each person attending will be given two dots. Out of the 19 ideas, they will need to vote for the two that they want to talk about the most. Of course, should they choose, they can put both their dots on their burning question of the day to increase the odds of it being selected as a topic of discussion. Democracy in action! Here are the choices based on feedback received by email, Facebook and Twitter. In the interest of total transparency, I took the liberty of paraphrasing some of the suggestions to make them fit the format and to include open-ended questions. 1. WHAT IS OUR COMPELLING MESSAGE? We’ve all had the conversation with someone who was thinking of moving their family to Fort McMurray. What are we saying? How are we saying it? Are we successful enough in painting a compelling portrait of our community? Are they buying it? Is this a public relations battle that is better fought with words or images, reality or actions. Are we trying too hard to change minds, to sell the image that we want portrayed? Is it working? What advantages would we gain by re-defining the paradigm of volunteerism to attract and include the new generation of “goals oriented” professionals that want to donate their time, but are driven, and in fact NEED to achieve measurable, LOCAL results? If all sectors were to rally around one strategy that would improve our image (perceived or otherwise), what would it be? Wouldn’t it be great to reach consensus on one take away item to integrate into our marketing and communication plans. When visitors to our community return to their homes, what is the image that resonates from their time in Fort McMurray? What is the iconic picture that stays in their minds? Or, what do we want or desire that image to be? How does the power of images play into our need to achieve a better balance? What is our community’s personality? Or, what do we want it to be? How can we use our desired personality to change the conversation and understanding about Fort McMurray and Wood Buffalo. What was the tipping point? When did our image become a challenge? What was the event or series of events that tipped the scales? If we can deconstruct how we ended up in the line of fire, perhaps it would empower us to better address the misconceptions. Fort McMurray’s media landscape has become increasingly fragmented and hard to navigate. As a currently unrated market it is difficult to determine the best and most cost effective way to reach our target audiences. Is it time for market research? Who’s in? In light of the recent presentation by Ezra Levant positing a new way of looking at the resource that surrounds us, how do we leverage oil sands pride to our advantage? Is the notion of Ethical Oil a flag that we should be flying? What would be the impact of wiping the names of Fort McMurray and Wood Buffalo off the map and starting anew? What naming convention would align with the increasingly important role this community and region is playing in the world? If we WERE to consider a name change, what would be some ways of making it happen? What advantages or disadvantages would there be in engaging the community in trying to find the name to sweep us into this next period of growth and change? How do we keep each other informed and engaged with our activities? How can we create a network to share and leverage ideas on a sustainable basis? What are pros and cons of a collaborative communications approach? What are the Top 10 “did you know” talking points about our community and region? What assets and attributes rise to the top that have strong potential to strengthen our external messaging? What are the Top 10 ways that our community and region are misunderstood? What are the messages and impressions we are trying to change? Is it possible to rank them in order of impact? We live in a region where opportunity abounds, especially for young people. What can we do from a marketing and communications perspective to make this place more appealing to the leaders of tomorrow? How do we leverage the vision of having a community where we can live, learn, play and work – a balanced future, with opportunity for all? Is this a vision that sets us apart, or is it just another tagline that can be applied to any community trying to promote itself? What can be gained by focusing our marketing and communication efforts on non-resource based messages: vibrant arts, dynamic nonprofits, outstanding sports, diverse cultures, etc. Do these aspects of our community have the potential of cutting through the fog? Are they “sticky” beyond our borders? What is one thing that can become a symbol for our community? Paris has the Eiffel Tower, Rome has the Coliseum, New York has the Empire State Building. What is the icon that could define us, set us apart? Too much energy goes into dispelling the myths and fighting the lie. What would happen if we focused our energy on something positive and inspiring? What role can authenticity play in promoting a more balanced understanding of our community and region? Are we authentic now? If so, how? If not, why not? Out of curiosity, what would be the two topics that you would choose? We'd love to know.